Congratulations to my friend Pete Falcone, who delivered some wonderful news today: the New York Yankees have offered his son, Joseph, a contract to play professional baseball. Joey served our country a Marine and was deployed twice to Iraq and once to Afghanistan as a combat medic. After leaving the military, he attended Columbia University as an Economic major and as a walk-on made the All-Ivy baseball team. 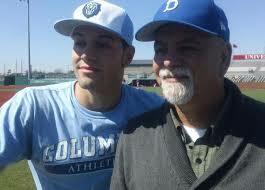 I am so proud of Joey and his Dad, who pitched in the majors for nine years, including four with the Mets. Pete is from Brooklyn and grew up a Yankee fan, and I’m sure he’s thrilled that his son gets to play for the greatest sports team on the planet. I thank Joey for the lives that he saved and for his service, and I am already among his growing number of fans. I have some photos from his first game today if you want? That would be great, thanks. send to 19@fritzpeterson.org. Baseball is a tough sport to be a fan of. I would say the majority of the non intoxicated fans weren’t booing the poor performance as opposed to the perceived lack of effort in a win or go home scenario. And that’s why I say it’s tough to be a fan. Being three-hit shutout makes it seems as though you obviously weren’t giving it your all, but if you think about it rationally, as Barry pointed out, they were up against the presumptive Cy Young winner who happened to have shut out the Yankees over 22 innings total this year. In other sports if a player decides to no-show on a game, it’s glaringly obvious. Like Lebron scoring 8 points in a do or die playoff game or a star qb taking 8 sacks in a super bowl or something like that. Baseball you can go 0-4 in agame and have done everything right. Fans can’t tell the difference. Anyway. That’s what I choose to believe. The booing was saying “just put some kind of hits together.” As if the players weren’t trying. Friday, August 7: Yankee Stadium, attending Tanyon Sturtze Night to raise funds for a great group, the Pinstripes Sports Dreams Foundation.